Sasha, the workshop instructor demonstrates setting the level for the bricks that will form the oven floor and hearth at the opening. A layer of firebricks forms the floor of the oven. Here we fit them tight together on a bed of sand, trying to leave no cracks or crevices for ash to accumulate. The fire will be built directly on this surface in the completed oven. With a circle for the oven interior traced onto the bricks, we begin to layer the cob mixture (in the bowl) onto the foundation, around the bricks. A mound of sand forms the shape that will be the interior of the oven. The sand mold will be removed through the oven door once the cob and plaster have dried. Smoothing the sand mold with trowels to ensure a symmetrical and smooth interior to the curved oven walls. Building the brick arch over a mold, to form the oven door. Bricks are mortared together with a simple clay-sand mixture. Final smoothing of the sand mold. Mary fell in love with the plastering trowels and smoothing process during this workshop. 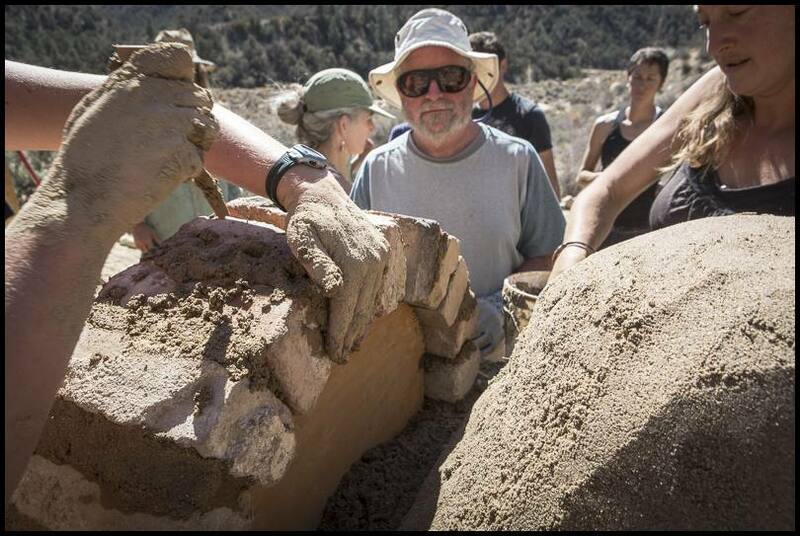 Participants begin building up the interior layer of the oven; the first layer is a dense clay-sand mixture, without straw. Next, a layer of dense cob is built up, providing strong structural support and thermal mass to hold the heat of the oven. After the dense cobb layer for thermal mass, we add a layer of straw coated with clay slip as a thick insulating layer. A layer of plaster tops the insulation, protecting the oven and providing the smooth outer surface. Smoothing plaster over the insulation layer. This is a stage where you can add sculptural details, though we kept this oven mostly smooth and simple. The door of the finished oven from the workshop; as it dries, the sand will be scooped out through the door. Sasha will be able to cook with this oven within the next week. During the workshop, we cooked in the older ovens at Quail Springs, enjoying pizzas, roasts, and cinnamon rolls prepared at different stages of the ovens' firing. Pizzas are the only thing cooked with the fire still inside; everything else is cooked after the fire is removed, just with the retained heat of the oven walls. We brought some food gifts from our farm in Missoula to our friends at Quail Springs, and were honored to have our leg of lamb roasted in the earth oven and shared with residents there. Traveling around the world, I am always amazed at how cool - literally comfortable - farmers' homes can be. On a trip to Cote d'Ivoire, on a project with the Rainforest Alliance, I accompanied farmers to fetch water from a neighboring diversified cocoa farm. While cocoa farms are known for their shade, the trees need regular care and pruning, so it's common for farmers' homes to not have as much shade as they might need during the heat of the day in West Africa. That day when we stepped from a hundred degree sun outside to the interior of an adobe brick hut, though, it was more than ten degrees inside. Later, back in the small town where I spent the night, my concrete hotel room was unbearably hot. Earth building is not new. While small farms have made shelter and homes out of clay, straw and sand for years, there are still habitable apartment buildings dating back not just hundreds, but thousands of years, and still inhabited. 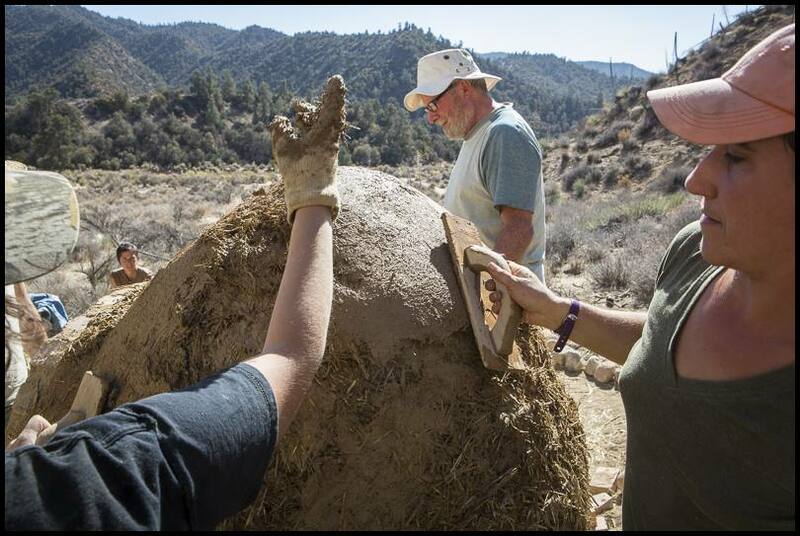 Earth building, commonly known as cob, is taking off in the United States. From pioneers such as the Cobb Cottage company in Oregon, to our network of friends around the United States, there is a growing community of natural builders helping demonstrate that we can have useable structures, spaces, and homes that do not need to be expensive or rely on the industrial economy. While a typical US home might last a lifetime, for many Americans, owning a home can trap us in a cycle of debt. 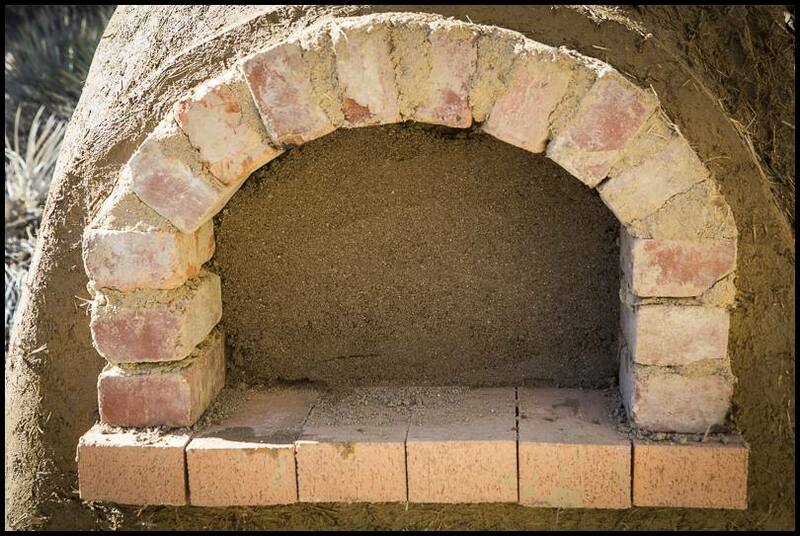 Precisely for this reason, our own fascination with natural building, and a connection with farmers who utilize this incredible proven technology, we recently traveled to Quail Springs to take an earthen oven building workshop. While I've helped in using natural materials to construct shelters for farmers in Africa and Asia, nothing beats more hands on experience. While we intend to construct some cob buildings on our farm in the coming years, we cannot wait to build an oven. 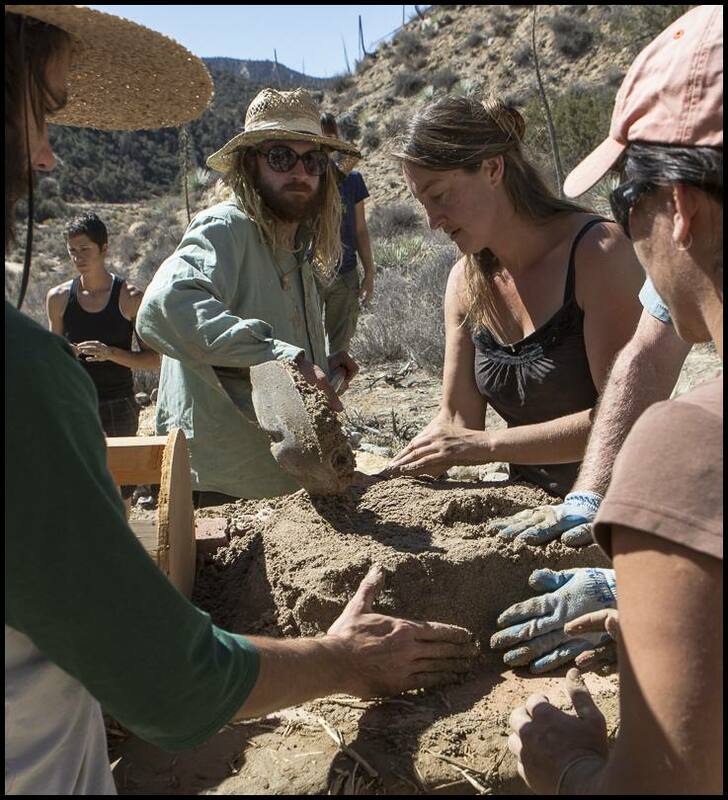 When our friends put out the word they were hosting a workshop to build an earthen oven, it was easy to decide we'd make the journey to California. We jumped at the chance. Basic cobb building is an approximate mixture of 1 part clay, 2 parts sand, and straw (though the ratios change depending on the texture of each of your materials). For building walls or for adding layers of thermal mass and insulation, you vary the ratio. While in our cold climate of Montana, we may need more insulation, the basic building materials and methods vary only slightly. Now that we are back in Montana, we are planning on building our own farm oven later this spring. We're itching to get our hands back into that earthen mix, but have to face up to the deeply frozen days coming our way, and will have to content ourselves with a few test-bricks mixed indoors, until we have the land and weather to work with in the spring. We've already talked about building some ovens with some great local partners. During our last night at Quail Springs, we cooked lamb we brought from Montana in one of their ovens. It could not have been a better way to end our trip. On our farm, we tend to build many of our own spaces - making our home and surrounding space custom-fit to us is just part of our way of living: it's what we do. My journey of working with wood started rough, acquiring prybars to recycle pallets for our first chicken coop. Since then, we've moved on to acquiring tools, first by borrowing them from our local tool library, and then acquiring our own. This past week we had a chance to deliver a series of chairs for a neighboring group's upcoming series of rocket stove and meat smithing workshops. The chairs are good for learning, sitting, and talking. All of the wood in the chairs has a bit of local history: the seat and back slats are made from pine boards that were reclaimed from the Arlee High School gym floor. They came to us in pretty rough shape still full of staples and nails from our friends at Heritage Timber. We spent hours of summer pulling to make the wood useable. We even enlisted family for a big work party on their summer visit. You can still see some of the holes from nails and staples, but all the roughness has been smoothed out. The leg and back supports come from pine trees that were thinned by our friends to manage for bark beetle near the Middle Burnt Fork of the Bitterroot River, a ways upriver of our own homestead. The blue streaks and patches that many of the boards show are the stain from a fungus that is introduced to trees by the bark beetles. We worked with all of this wood at several stages, planing it to smooth the surfaces and get uniform thickness, ripping the gym floor planks to narrow slats, and rounding the edges of all pieces with the router and sander for smooth and welcoming edges. We like that way that, from a step back, it appears that the knotty white pine is resting on pieces of curved driftwood. These chairs are inspired by a design from a Canadian woodworker and modified by us to accomodate both shorter and taller people. The chairs can be adjusted slightly so they sit up or more reclined, good for listening or reading. They are not dining room chairs, but we do like them for large gatherings. 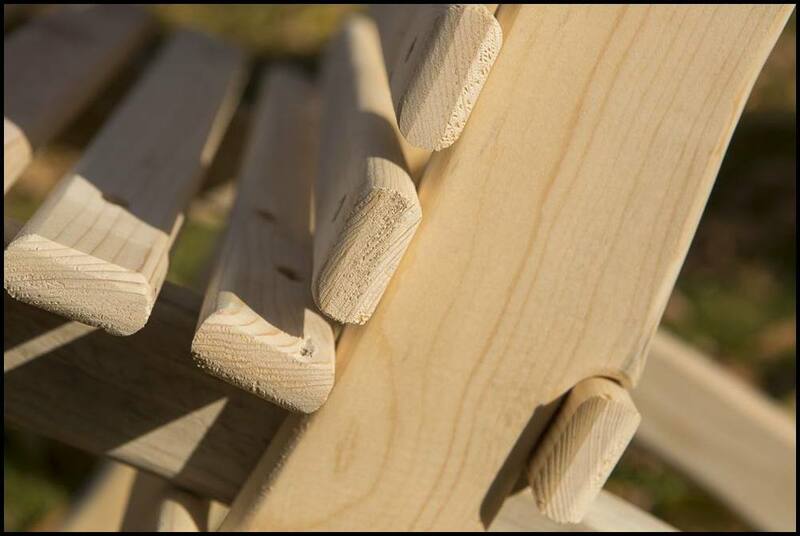 Nothing is wasted with our wood. The wood scraps help heat neighbors' homes and the shavings from the router and planer are used as chicken bedding for our laying hens. They weigh 13 pounds and, as you see in the images, the legs and seats fit together so they are easy to store and transport. We've tested them with 320 pounds of weight - stacking both of us and our dog onto the seat to ensure that they hold up well. They are guaranteed for life. We finish them with a non-toxic, VOC-free stain that highlights the wood and can ship them all over the United States. They are available for sale to help fund our own hand built life, our farm, and everything that we build each day. We have several available now, other orders ship in two or three weeks. They are available for $69 each and ship for $30 each in recycled packaging. Discounts are available in orders over 12. If you are within driving distance of Missoula, we'll also consider delivery using our vegetable oil car for a bulk order or can arrange to ship via freight for those farther away. You may order the chairs here.